Talbert & Talbert Client Feature: Planet to Plate Inc. This month we feature our client, Planet to Plate Inc, an early stage start-up with a mission to re-establish the relationship between planet and plate, one community at a time. Today, society’s consumption of global resources is reaching an unprecedented level, ultimately limiting resources and destroying our environment in the process. Specific to the food industry, over-farming and poor supply chain strategies from distribution giants have begun to cripple many communities, leaving local businesses disenfranchised and lowering the socio-economic status of once thriving regions. Planet to Plate aims to revitalize these communities by infusing real estate with the creation of sustainable spaces where the growing, cooking and selling of food all occur under one roof. Under the guidance of CEO Chris Corkery, Planet to Plate’s core story is a culmination of Chris’ ambition, his love for food and the belief that everyone should have the agency to participate in the story of where their food comes from. After building a successful career in advertising, Chris left the corporate world to pursue his passion for the culinary arts. Growing up, Chris was no stranger to the food industry and had plenty of years experience working the front of the house from busboy to management. It was during this time that Chris developed a love for the experience behind sharing a meal with others, ultimately fueling his decision to make a career change many years later. Upon graduating from culinary school, Chris began working the back of the house rounding out his exposure to all facets of the restaurant business. Despite his deepened respect with the entire process behind creating a meal from scratch, at his core Chris still saw the front of the house as his more enjoyable counterpart, but was beginning to think bigger. He knew he wanted to pursue a socially responsible concept that involved bringing people together for meals, without sacrificing a profit-driven model. However, the restaurant industry is notorious for having low profit margins and volatile circumstances, making success quite challenging. Regardless of the odds, Chris was determined to breakthrough. This desire gave way to his first step in developing Planet to Plate. NY Seed, a company Chris created to focus on the brand and vision, allowed for Chris to have a platform for investors and potential partners to understand the dynamics of what he was trying to achieve. As mentioned, he wanted to create a space where the growing, cooking and selling of food was all in one space. To bond this idea of land, food and profit, he enlisted the help of professional architects as partners to bring this creative venture to the next stage. Chris’ vision was to have access to a large enough space where Planet to Plate could truly have an impact on the community. However, Chris first steered his efforts toward New York where he aimed to achieve proof of concept. After nearly three years of focusing their efforts largely on the five boroughs, NY Seed met an angel investor that believed in Chris’ original plan to go big. Equipped with a new confidence and the backing needed to seek out a space that fit their needs, the small team set their eyes on a big idea in Milwaukee, Wisconsin. While the journey has been long, the progress made over the past year is significant and the dream of Planet to Plate is now transitioning into a reality. With community and sustainability in mind, the team quickly immersed themselves within Milwaukee seeking like minded businesses and the cooperation of local universities taking part in the complete story of food production and consumption. By creating a business that is three pronged, Planet to Plate helps distressed property managers revitalize their spaces, disenfranchised companies get a chance to flourish again and provide education to bring in a new age of workers. 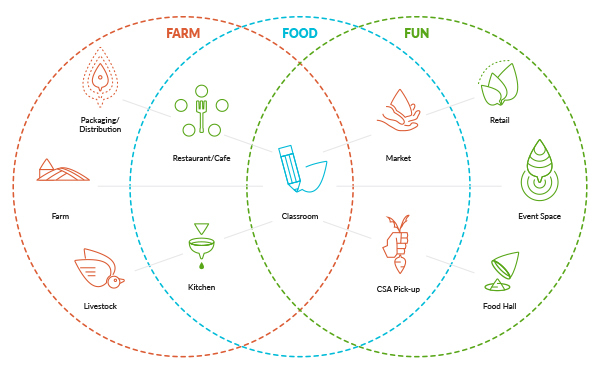 Tying this together with a patented software program, Planet to Plate’s Hub and Spoke model can be applied globally to local communities. It did not take long for leaders and advocates of Milwaukee to welcome this fresh take on revitalizing local businesses and the area as a whole. Though the proof of concept was there, Planet to Plate recently partnered with an advocate of community, education and sustainability to help spear-hold the progression of the space. Former NBA star Will Allen was introduced to the team and the synergy was realized immediately. Upon his retirement, Will Allen became heavily involved in philanthropy helping lower-income students achieve their potential through urban agricultural education and hands-on learning/activities. Planet to Plate not only provides a safe haven for students to learn about the story of food and participate directly in the operations, it also provides structure in a controlled environment where they can participate in making their community more sustainable. Naturally, the fit was there and a shared vision was created. With Will onboard as a brand ambassador, Planet to Plate has reached a pivotal point in its story and over the coming months will see more milestones achieved with development of their first location in sight. To learn more about Planet to Plate and the global impact it is on the verge of making, check out their website (planet2plate.org) or feel free to reach out to us and we will connect you with the team!